"Dammit man, dare we call ourselves human if we don't act?! What do you mean, 'Thank you'?!" "It's not enough to survive. One has to be worthy of survival." "By God, Jim! You can't seriously be considering this! Screw the Prime Directive, there's no time for debate! We have to act now to rescue the High Priestess; forget the MacGuffin and think about doing what's right! What's that, Spock? 'Logic?' If we listened to your cold reasoning, you'd have us look for that stupid Cosmic Keystone while innocent people suffer! Especially since one of them could help us get it a whole lot faster!" The McCoy is another part of the Freudian Trio, along with The Kirk and The Spock. (Specifically, the Id.) Where the former is rational and intuitive, and the latter is cold and logical, the McCoy is emotional and humanistic. He cares about others deeply; for him doing the right thing is not a question of convenience or moral relativity, but about the concrete reality right now. Which is to say, someone like The Kirk cares about saving people; the McCoy cares about making things right. That is to say, when placed in front of the To Be Lawful or Good dilemma, the McCoy will always choose the "Good" option in a heartbeat. This often leads the heroes into hot water as this concern for others blinds him to complications in the Moral Dilemma of the week and leads him to advocate (or take it upon himself to do) "the right thing", regardless of how disastrous it would be in the short or long run. That said, they help keep the drama of a situation personal both for the characters and the viewer, reminding us just why the Littlest Cancer Patient deserves for The Hero to use the Applied Phlebotinum that only works once on him rather than to get them home. To be fair, the Spock can be just as compassionate, but is tempered with detachment and enough forethought to realize that the right answer might not be the correct one, (illogical as that sounds). This makes them more willing to sacrifice a few people for many (or sacrifice themselves). The McCoy is frequently a target for reminders about the Prime Directive; one or more episodes might focus on how having his heart on his sleeve can actually cause quite a bit of damage to the people he "helps" with the best of intentions. The McCoy still functions as an admirable character, however, due to his absolute devotion to his moral beliefs and his refusal to give in to what others may tell him. To him, there is no such thing as acceptable losses (unless offset by a larger return fitting the loss). And if you start claiming that numbers can be lost or that A Million Is a Statistic, you can expect a thorough chewing out for your coldness. In the McCoy's mind, every life matters and everyone deserves to be saved. While The Spock sees people as numbers in the greater picture, The McCoy sees people with real lives and emotions. Not that he's unwilling to listen to The Spock; he just doesn't want his own argument to lose legs in the process. Also, the McCoy exists as a counterpart to The Spock. If they are the moral center of the team in general too, then they are The Heart as well. Likely to be the Red Oni in a Red Oni, Blue Oni combination. Closely related to the McCoy are Hot-Blooded and Agent Mulder. Probably sides with the Romanticists in Romanticism Versus Enlightenment. The McCoy is Honor Before Reason personified, and may occasionally be a Strawman Emotional. Will sometimes use I'm a Doctor, Not a Placeholder. The main characters of Tengen Toppa Gurren Lagann fit directly into this trope. Rather than listening to logic, they prefer to screw the (Physical and otherwise) rules and dive right into a situation. They kick reason to the curb because that's the Team Gurren way. Murrue Ramius from Mobile Suit Gundam SEED is a more reasonable McCoy in a command position, with a Sergeant Rock as her Deputy Captain, and The Kirk as an Ace Pilot and both of their primary advisor. Kallen and Suzaku from Code Geass fill this role for their respective sides. This personality archetype is, with a few exceptions in certain characters (namely Usopp and Robin, and then only occasionally for either), a prerequisite for joining the Straw Hat Pirates in One Piece. It also seems to be the default personality for the majority of the characters aligned with good, period. In Puella Magi Madoka Magica, Sayaka and Madoka are the McCoys to Homura and Kyuubey's Spocks. In this way, it almost seems to Take a Third Option when it comes to the Emotions vs. Stoicism debate: Sayaka lives by her emotions and ends up paying for it in every possible universe becoming a Witch in the main timeline, Madoka ends up rewriting the universe into a happier place through the Power of Love, Homura is by far the most competent Magical Girl outside Madoka and none of the latter's achievements would have been possible without her and vice versa if her Back Story is any indication, while Kyuubey has an arguable point in the goal he's working towards, but does so in an inarguably cruel and heartless way. In other words? Neither is specifically better than the other, and in fact both may be necessary, depending on the situation. Umi Ryuuzaki in Magic Knight Rayearth takes this role. It's not enough for her to defeat Ascot—he has to apologize and take responsibility for his monster friends, dammit! And when he does, she smiles and encourages him to make a complete HeelFace Turn, resulting in him developing a huge crush on her. "McCoy in a way represents for us, or represented for us, the extremes of Kirk and Spock. If Spock is extreme logic, ... extreme science, and Kirk is extreme emotion and intuition, here you have a very colorful doctor, essentially a very humanistic scientist. So he, in a way, is literally and figuratively a representation of two extremes that often served as the glue that held the trio together." Though it comes off in a very similar manner to the show, and is very well played. Anakin Skywalker shows elements of this trope in the Star Wars Prequel Trilogy. Especially since this was the reason he turned to The Dark Side. Mr White of Reservoir Dogs, in comparison to the cold and logical Mr Pink and the psychopathic Mr Blonde. He tells the dying Mr Orange his name and defends him all through the movie from accusations that Orange is a rat, based purely on the fact that he likes the guy. The Avengers: Iron Man fits The Kirk, and Captain America fits The McCoy. Given that Thor is calculative and likes control, and that Banner (when he's not Hulk) is calm and logical, either one could be The Spock. In The Brothers Karamazov, the brothers form a Freudian Trio: Alyosha as an idealistic Kirk, Ivan as the cold, rational Spock, and Dmitri is the emotional McCoy. Marianne Dashwood in Sense and Sensibility, in contrast to her sister Elinor. Possibly the Trope Maker, considering this is one of the first known intentional uses of it (Austen intended the sisters' Emotions Versus Stoicism to be a metaphor for Romanticism Versus Enlightenment). Also notable as one of the few cases where the McCoy is wrong and has to learn to be more reserved, rather than the other way around. In the Harry Potter books, Harry, Ron and Hermione start out as The Kirk, The McCoy and The Spock respectively. Throughout the course of the novels, they all grow out of and beyond these labels, often switching around (Hermione's dedication to house-elf liberty is very McCoy-ish, for example) or not quite fitting any of them. In These Words Are True and Faithful, Rob upbraids Ernie for knowing what will happen if Danny comes to see Ernie as a reliable source of money but giving Danny money anyway. Ernie's only justification is that he felt bad for Danny. Ned Land from 20,000 Leagues Under the Sea is an emotional harpooner who isn't excited about going around the world on the Nautilus and simply wants to return to civilization, in contrast to Aronnax's Kirk and Conseil's Spock. In the Star Trek novel Star Trek: Vulcan's Forge Rabin (an earlier friend of Spock's) is like this, though more friendly and less crotchety than ...the real McCoy. The Dresden Files: In Cold Days, Titania states that she acts according to "the wisdom of the heart", compared to Mab, who she says acts according to "Reason. Logic. Calculation. The cold numbers. The supremacy of the mind.". Harry also acts as this at times, most prominently in Grave Peril (where he absolutely refuses to abandon his girlfriend even knowing that it could mean an all out war with the Red Court, and it does indeed cause a war that nearly gets his own side wiped out), and Changes (where he goes against pretty much every piece of advice he'd previously given himself or others for the sake of rescuing a daughter he hadn't even known existed until a day before). However, it should be noted that this mindset is heavily deconstructed in all of those examples; Titania's "wisdom of the heart" makes her unhelpful even when all of reality (including her own domain) is at stake if Harry fails, and Harry's actions have truly disastrous repercussions for the world and the people he cares about (predictably for The McCoy, the latter hits him much harder than the former). Animorphs: Cassie tends to be this. At an early point of the story, she goes into 10-Minute Retirement because she needlessly killed an enemy Mook, even though defecting means indirectly endangering the human kind itself. The trope is named for Doctor Leonard H. "Bones" McCoy. He not only stressed humanism, he was all but dominated by his emotions, to the point that he seemed to find no value in logic whatsoever, even in situations where it would fit... um, logically. There are many Star Trek: The Original Series episodes wherein, had they listened to the Doctor instead of Spock, the Enterprise would be a cloud of space dust. One of the novels implied that he was partly this as a semi-deliberate counterbalance to Spock — in one take on the Yesteryear timeline, where Spock did not exist and the first officer was the Andorian Thellin (Andorians being stereotypically passionate), the good doctor was a great deal more logical and rationalistic in his outlook. The counterbalance can be seen in some episodes. 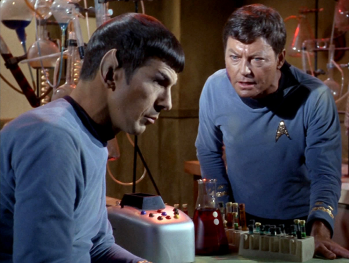 In '"The Enemy Within" for example is Spock the one arguing for taking risks in order to save lives and McCoy the one wanting to take things slow and use the scientific method before any impulsive action. There's a clear ideological bent this way in Starfleet medical school in general — an inclination to take "first do no harm" as far as the Prime Directive allows it; this may be because subsequent series are a Generation Xerox of the first. (Starfleet members from the American South are also frequently like this.) Examples include Dr. Crusher, who quite often would ignore rational ordeals and run into the battleground to try and save someone, and the more obnoxious Dr. Pulaski, McCoy's Distaff Counterpart. They definitely take an oath like the Hippocratic one, perhaps a modern modification of the oath like this one , or perhaps something unique to the Federation. Deep Space Nine had Kira Nerys, while Odo was usually the more logical one. Voyager used Captain Janeway in this role, while Tuvok and Chakotay would try to balance her out with logic. Tom Paris also had his McCoy moments. Enterprise had engineer "Trip" Tucker. Firefly: Kaylee often was the one who was more about the right thing, like not abandoning River and Simon. Simon is a Spock in most cases, but he turns into a McCoy about anything involving his sister. He gave up his career for her, after all. Wash also plays a more pragmatic version of this role at times: "Can we vote on this whole killing people thing?" Game of Thrones: Due a heavy emphasis on honor and bravery, Barristan becomes this to Jorah's Spock and Dany's Kirk. Sherlock: John definitely. He's also kinder than Sherlock and wants to help out everyone, but has his moments where he wants to look out for Sherlock. Jack O'Neill in Stargate SG-1 was more often than not the McCoy in addition to The Kirk; playing a foil to the more rational Samantha and Daniel (Teal'c had his McCoy moments as well). He'd sometimes choose to help others, or incessantly bug Sam and Daniel to explain to him why they shouldn't help others. Daniel himself is more often the McCoy, especially when he feels the current situation is SG-1's fault. O'Neill was more often the calm, rational military leader and Daniel has to convince everyone else on what was right. Both Jack and Daniel could turn into McCoys. They'd often get into arguments, not about whether to help, but HOW to help. A prime example: in "Scorched Earth", an alien wants to terraform a planet so his civilization can be rebuilt there. The terraforming would kill the population already living there. Daniel wants to talk to the alien and reach a compromise. Jack wants to blow them up. While Teal'c is usually the Spock, he has had his time as the McCoy, usually when someone does something that sends him on a Roaring Rampage of Revenge. There was an entire episode dedicated to such an event. Lost in Space had its own Freudian Trio with Will Robinson, the Robot and Doctor Smith. Ironically, the most logical of them all, the Robot, would frequently prove his great titanium alloy heart by performing a Heroic Sacrifice for the crew. Vila Restal from Blake's 7 had his moments. Buffy the Vampire Slayer: Willow and Xander alternated — and often tag-teamed — as the McCoys of the Scoobie Gang, wanting to do what they thought was right, no matter how stupid or reckless it was, and occasionally put Giles down for trying to stay rational in emotional situations, calling him heartless. When Willow was kidnapped, the Scoobies (especially Oz) were the McCoy, Giles was The Kirk and Wesley was The Spock. Buffy herself was the McCoy more than anyone else, often thinking with her heart rather than her head, such as her reluctance to kill Angel in season 2, endangering the world as a result, her refusal to kill Dawn in season 5, endangering the world as a result, her refusal to kill Spike in season 7, endangering the world as a result... Sensing a theme here? Doctor Who has a tradition of this, when the companions usually act as the heart and the moral compass for the often aloof and alien Doctor. Barbara was the first companion to somewhat "humanise" the unpredictable and sometimes callous First Doctor. In the new series, Donna lived and breathed this trope, especially as the Tenth Doctor's characterisation grew darker and darker. Ironically, Jack McCoy of Law & Order is not the McCoy for the show. That role is typically filled by the female A.D.A., except when Angie Harmon played that role as a conservative Republican, so they made the new D.A. a female college professor, and made her the McCoy. Of course, some can take it too far: Serena Southerlyn was too much the McCoy, which resulted in her being fired. This also led to an example of Suddenly Sexuality. Sheldon, from The Big Bang Theory, insists that since he's Spock and Leonard is Kirk then Leonard's girlfriend Penny must be McCoy. Wilson from House is a stark contrast to House himself, who doesn't give a damn about anyone. In the words of his snarky counterpart, "You love everybody. That's your pathology.". Sam is very much the McCoy of the iCarly Freudian Trio, right up to her constant arguing with The Spock of the trio, Freddie, and being swayed by The Kirk of the trio, Carly. Delenn in Babylon 5 is definitely a McCoy with her romantic and mystical outlook and her often spectacular displays of Honor Before Reason. B5 doesn't really have The Spock to balance her. Sheridan is a Kirk and Franklin, who is The Spock or something close, doesn't interact with Delenn enough to balance her. As B5 is something of a romanticist work, that is reasonable. Franklin gets his moments as The McCoy. "Believers" is the biggest example. In the episode, he's caught between his medical ethics, which compel him to perform a simple operation to save a young boy, and the beliefs of his patient and his parents, who think that cutting open his body will cause his soul to escape. In the end, he's so driven by his conviction that he's right and the parents are misguided fools, that he performs the operation in secret. This blows up in his face at the end, as the parents decide that their son died on the operating table, and what's left is an empty shell. Which they kill at the first opportunity. Garibaldi fits very well the role of The McCoy as he's very emotional, bases his actions on his instinct and intuition and rarely sees the bigger picture. Both Ivanova and Franklin have similar Spockesque roles and interact with Garibaldi often enough. Zhaan, Chiana, and to a lesser degree Jool served as McCoys most often on Farscape. John did as well sometimes (especially in the first season), although he became more The Kirk as the series went along. Aeryn and D'Argo were usually Kirks, but on occasion they delved into McCoy territory, usually when it came to their loved ones (John, Pilot, and to a certain extent her mother for Aeryn, Jothee and Chiana for D'Argo). "Doc" Soto in Alcatraz seems to be slipping into this role in opposition to Hauser's Spock. Both Harm and Mac in JAG, but most especially Harm, typically functioned as the McCoy of the series. Mac [to Harm]: Look, you run on emotion. It's what makes you a good lawyer! George, the main character of Dead Like Me, in contrast with Reuben's The Kirk. Scandal: Quinn and Abby both serve as this for the rest of the team. Horatio Hornblower: Archie Kennedy is the show's heart and soul, especially in "Mutiny" and "Retribution". He's very humanistic and always wants to do what is right and just. Archie is the first one who speaks about Captain Sawyer's incompetence, his unjust abuse of Midshipman Wellard horrifies him and is generally dissatisfied with the lack of discipline on the Renown. note The three lieutenants together form a nice Freudian Trio: Archie is the id (emotional, intuitive and quicker to act), Horatio is the ego (heroic, mediates between the two, rationally evaluates the situation but hesitates to act) and Mr Bush is the superego (logical, calm, rational, and slower to act). Abby from The 100 has an intense desire to save everyone, but unlike her more pragmatic daughter, will usually refuse to accept any solution that involves killing others or allowing them to die, insisting there must be a way to Take a Third Option. This is apparently a new development for her, as prior to the start of the series she was willing to execute her own husband because she felt he was a danger to the Ark's stability. It's suggested her subsequent refusal to accept death may be an attempt to atone for that act. Rembrandt from Sliders is clearly The McCoy, as is the moral voice in many episodes, much more emotional and care a lot for others in a humanistic way. He's also much less interested in scientific approaches than his fellow sliders like Quinn, Arturo and to a lesser extend Wade. In Dino Attack RPG, Rex fills this role, in contrast to the more logical Frozeen and the more practical Greybeard. He is guided largely by emotion for better or worse, and is prone to making passionate yet irrational decisions based upon what he believes is right in the moment. This includes his preferences for saving Mutant Dinos (in a war intended to exterminate them) and the way he'll respond if someone threatens a friend (such as attacking Pharisee and Bogart when they tried to place Amanda under custody, even though they were doing it for her own safety). In 1776, John Adams is a McCoy protagonist, incredibly passionate about American independence. He starts a stick-fight with Dickinson at one point and nearly jeopardizes the entire vote over the anti-slavery clause, but he's an absolute Determinator about wanting freedom from England and rights for all citizens. In Persona 4, this role is shared by Yosuke and Rise. Garrus Vakarian of the Mass Effect series evolves into this over the course of Mass Effect 1 & 2. By the second game, he forms a team of Cowboy cops to combat the corruption on the station in Omega. True to the "Get into hot water" portion, his whole squad ends up massacred. Starting in Mass Effect 2, Joker ends up pairing off as The McCoy to EDI's The Spock, appropriate as EDI is a Artificial Intelligence. Jacob and Miranda have a similar dynamic as the two senior Cerberus officers aboard in ME2, along with Tali and Legion. BioWare seems to enjoy this character dynamic. Another take is in Knights of the Old Republic where Carth and Mission tend to take turns on this. They're higher on the Karma Meter than the party's Jedi, quick to lose their tempers or say something sarcastic about someone's shady operation, and faster to call What the Hell, Hero? when the Player Character does something dark-sided. Mission is a little more so because she's fourteen years old and hasn't grown up enough to see the point of gray morality. Carth believes more in the ideals of the Republic than the actual law, has little use for Lawful Stupid Jedi dogma, and decides that he's going to be The Conscience for your Player Character. Merrick from Dawn of War Retribution objects violently to the notion that he and his men are cannon fodder. After an incident that ends with thousands of soldiers dying in a cataclysm, he attacks his commanding officer, and has the balls to tell him off whilst a commissar holds a gun to his head, itching to pull the trigger. Tidus practically embodies this trope in Final Fantasy X, frequently throwing all respect for the alien culture he finds himself washed up in to the winds in order to do what he perceives as the right thing, particularly when it involves stopping people from dying. The titular character from Sonic the Hedgehog, in contrast to Tails and Knuckles. Lloyd Irving in Tales of Symphonia has spades of this. While Colette is The Chosen and works hard to bring about the regeneration of the world through a set quest procedure until it turns out to not be the case at all with Cruxis, Lloyd doesn't follow tradition and urges others, in his own short-sighted viewpoints, from half-elves discriminated to Exspheres and what they're used for, to make their own decisions and accept/help each other along the way. Sora from Kingdom Hearts . He openly believes any and all life and world has value. While Kingdom Hearts II had him not believe that for the Nobodies (heavily implied to be the anger from the others in his heart effecting his emotions) by KH3D he's gotten over it and insists all Nobodies have value. And he repeatedly tries to reform the villains too. Sergeant John Lugo from Spec Ops: The Line is the most emotional and snarky of the Delta Force Trio. He's also the first to get upset at Walker. Vandham of Xenoblade Chronicles X is this to Nagi's Kirk and Chausson's Spock. He takes it hard when he accidentally leads Team Elma into a trap that almost gets them killed. The Wrothians and Prone fill this role for the various races, contrasting with the Ma-non's and Orphe's Spock and Humanity's Kirk. Durkon and Elan sometimes fall into this, in contrast with Vaarsuvius's The Spock. Elan gets in trouble because of his good heart and poor sense, but gets out of it through his charisma and dumb luck. Durkon is more restrained, and forms an inversion of the usual temperaments with The Spock, as he is an emotional rock compared to Vaarsuvius's fierce intellectualism. Miko Miyazaki was also sometimes like this, although she mostly expressed her concern by slicing the cause of the problem to ribbons. Conrad from Hanna Is Not a Boy's Name is not a very humanitarian/sentimentalist example, but he is the only part of the main triad (himself, Hanna and Zombie) that is freaked out by the general supernatural weirdness of the comic. He's pretty much a staple Only Sane Man who questions everyone else's logic and peculiar calmness in the face of things that should scare the crap out of normal people like him. Arcturus Winrock from Suicide for Hire pulled a HUGE McCoy on Hunter when he killed a cancer patient. In Harkovast Scatterpod plays the McCoy to Quinn-Tain's Spock over the morality of Quinn-Tain killing BrightLeaf . In the ''Global Guardians, both Arachne and Ultra-Man fill the roll of the McCoy. Achilles, the team leader, is The Spock, while Guardsman is The Kirk. Mudd from The Book of Stories OCT was this. Dreamscape: Kai (The Spock), Eleenin (The McCoy), and Drake (The Kirk); the three stoic human protectors of the planet. Eleenin is The McCoy/Id because she puts teamwork above logic, and she believes in the potential of everyone, even if they doubt themselves. Star Trek: The Animated Series: Mccoy again, naturally. Katara from Avatar: The Last Airbender. She once detained the group for three days by essentially poisoning Appa (well, she just fed him berries to turn his tongue purple, but she had no idea whether he could safely eat them) to help a village who lived on a polluted river, even destroying the factory that polluted it, in spite of being on a tight schedule. Sam in Danny Phantom forces Vegan meals and steals frogs from being dissected in her school, displays her disguise on a Beauty Contest to bring individuality to the girls, and other humanitarian beliefs she has up her sleeves. When she's not doing that, then she makes sure Danny is going the right path. Snap from "ChalkZone". He's the most emotional of the main trio. Snotlout acts as this to Fishleg's The Kirk in Dragons: Riders of Berk, trying to get him to abandon his pacifistic, intellectual in favor of his more aggressive, impulsive, warrior side. He usually does this by antagonizing him like in "Worst in Show", where he uses his obnoxious boasting to get under Fishleg's skin and provoking his competitive side or helping him like in "Quake, Rattle and Roll!" where he tries teaching him how to fight dirty when Fishlegs tries to help the Gronkles in Dark Deep face the Catastrophic Quaken. Justice League gives this kind of dynamic, albeit with shades of gray, with the Trinity: Batman is clearly The Spock and Superman The Kirk, on the other hand the most emotional and hot blooded of them will be, of course, the brave Amazonian warrior Wonder Woman as The McCoy. Winston Churchill was a McCoy, while FDR was a Kirk. Whether Marshall or Stalin was The Spock depends on how you view Stalin. Spocks seem to end up as a Number Two in Real Life as much as Hollywood. Maria Theresa often seems to come off as a McCoy. Like Churchill, she had her ruthless side though. It comes with the job. St. Ioannes Chrysostomos became during his tenure as Patriarch of Constantinople famous for almost continuously chewing out the city's population for their extravagance and reminding them to care for the socially disadvantaged in weekly Rousing Speeches; so much that he was removed and exiled. Repeatedly. A number of political controversies seem to be about McCoyness versus Spockness. No Examples Please!